This is a high tech sci-fi take on old fashioned westerns. The grit, violence, and raw circumstances make it a bundle of toughness that shines light on the human quality of perseverance. This is Mad Max with a brilliant gun fight, and a heap of modern motorcycle racing. Fifteen year old Adam Stone lives in the harsh desert town of Blackwater and wants nothing more than to get out. His one chance of earning a one-way ticket to the luxurious world of Sky-Base is also a potentially deadly one: win the brutal Blackwater Trail byke race. Adam, along with the mysterious Kane and tough, gorgeous Sadie Blood, set out to ride this hellish race and find themselves pushed to their limits, hunted by dangerous foes, and faced with cruel truths. This entertaining, wonderfully crafted novel is part dystopian, part western, and all kinds of thrilling! While reminiscent of The Hunger Games, in its razor-sharp, thought-provoking look at class; humanity; and survival, and its unabashed brutality, Stone Rider offers its own unique and complex premise. A bleak, yet entirely enthralling setting with harsh desert landscapes and almost otherworldly seeming Sky-Base. Adam’s world is a gritty, unforgiving, and, at times, bloody, one. 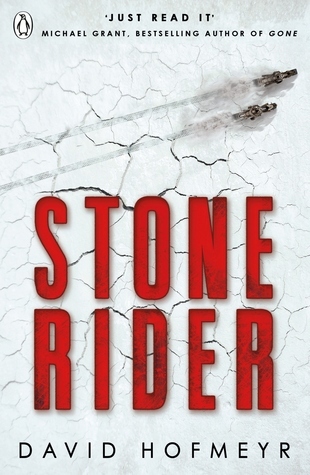 From the saloons selling surprising offerings and the sparse, broken feel of Blackwater to the high-tech world of bykes and Riders, drones, and space civilizations, the cool mix of old-time western and futuristic sci-fi elements within Stone Rider is fantastic.